His and Hers hand towel gift set featuring embroidered wedding ducks. His and Hers hand towel gift set featuring embroidered wedding ducks. A ducky bride and a groom wedding hand towels his and hers gift set. A cute pair of wedding ducks are embroidered each onto two white cotton hand towels which will make a very unique and useful wedding gift for the big occasion. His and Hers hand towel gift set featuring embroidered wedding ducks. 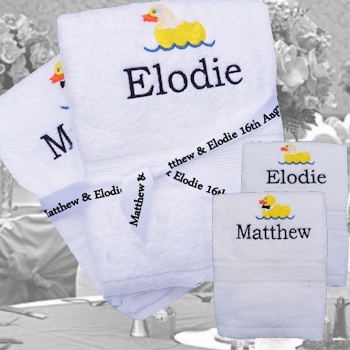 A ducky bride and a groom wedding hand towels his and hers gift set. A cute pair of wedding ducks are embroidered each onto two white cotton hand towels which will make a very unique and useful wedding gift for the big occasion. An ideal unique gift for newly weds, brides and grooms and even anniversaries. Personalised with the couples names, a nickname or initials embroidered in a thread colour of your choice. Set consists of 1 x white hand sized towel embroidered with duck bride for her and 1 x white luxury hand sized towel embroidered with duck groom for him. Optional added presentation for a personalised printed satin ribbon, please select add a personalised ribbon, a small fee applies.